※Method 1: Links to us. Send us your website page which links to us (www.fanplusfriend.com), we would issue you a VIP e-card. Post and share in our Facebook page or email us your good photos wearing our products. Take part in other random activities (notification of new activities would be posted on our website & Facebook page). ※Method: client who purchase $1000 from Apr.2014, would have an 12months Silver VIP membership; after that, she/he would keep this Silver VIP membership for next 12 months if she/he would purchase another $400 or above. ※Method: client who purchase $2000 from Apr.2014, would have an 12months Golden VIP membership; after that, she/he would keep the Golden VIP membership for next 12 months if she/he would purchase another $800 or above. 1 Sale items, special limited items and additional services NOT available in Reward 1. 2 Reward 2 will be issued to customers' Fanplusfriend website account. Notification Email will be sent when issued. 3 No order amount total limit for Reward 3. 4 The spending total includes shipping fee. 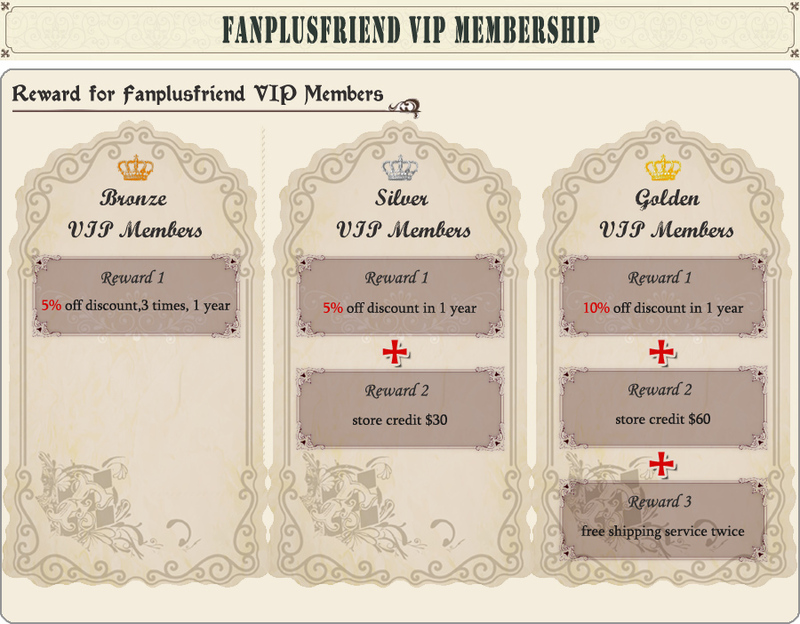 5 To keep the membership, VIP members may spend a special total in the next year (Silver VIP $400 and Golden VIP $800). If the total doesn't come to the line, VIP degree will be demoted. 6 All old VIP coupon code will be expired after Jan 1st, 2015. 8 Winning award will expire next year if haven't used for Bronze VIP. 9 Fanplusfriend reserve the right of final explanation.